The Old Stone Inn bed and breakfast is peacefully located in the arts & crafts town of Waynesville, surrounded by the Blue Ridge Parkway in the midst of the Great Smoky Mountains. It's an easy drive to Cold Mountain, the Biltmore Estate, Cherokee Indian Reservation and the Great Smoky Mountain Railway. The Inn offers classic, comfortable lodging in rooms, suites & cottages, as well as award winning fireside dining in the stone and log dining room. 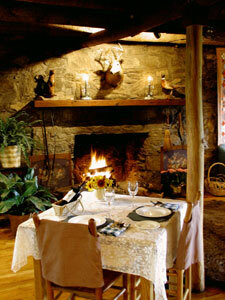 Fine wines, white tablecloths and candlelight enhance an ambiance for romance and memories. Rates range from $89 to $174 per night for two including a bountiful breakfast. Special discount mountain activity packages combine dinner with horseback riding, whitewater rafting, Biltmore Estate, Great Smoky Mountain Railway or Theater Tickets. 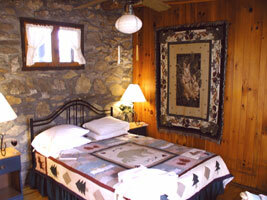 New this year is the 3 night Cold Mountain package. The Inn is suitable for small weddings and business meetings. Small pets are accepted with advance notice. 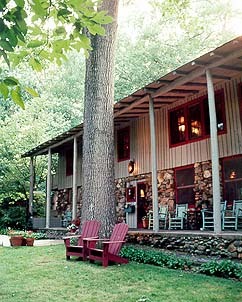 This and other North Carolina Bed and Breakfast Inns can be found here online in The Register.